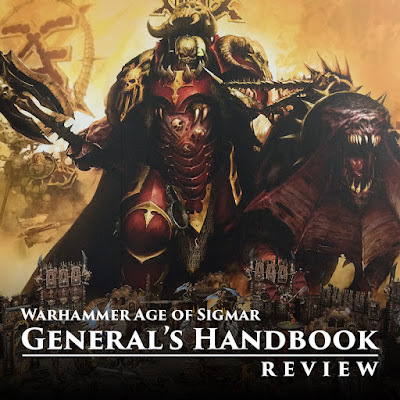 The most important book for Age of Sigmar since it released over a year ago is now here in the form of the General's Handbook. This essential gaming tome provides you with three exciting and fun ways that you can play the game. While the inclusion of army structure and points is undoubtably exciting, there is so much more in here as well! The fabled General's Handbook is finally here and on gaming tables the world over. When news about this book was first teased at months ago the internet nearly exploded with demands of "I want now!" Which is, of course, a very good sign. Well I can safely say that it has lived up to all of the expectations people had for it. This soft cover book is graced with the presence of Khul, the original nemesis of AoS, as well as a beautiful gaming table complete with scenery, models, and everything else you need to play the game. I personally think it's the perfect cover for a book like this, because right away you know it's more about playing the game and the mechanics of it instead of a continuation of the narrative. When you crack it open you get a brief rundown of what's in the book, and the very basics of the games, such as what's a warscroll and a battleplan. After that the book is essentially divided into three parts, Open Play, Narrative Play, and Matched Play. To make this review flow a bit better I am going to break each section off on its own below. Open play is essentially what we have been playing since the game launched. This is Age of Sigmar straight out of the box with no add ons or changes. It talks a bit about the best ways to play this, such as talking to your opponent beforehand. The big cool thing here is the addition of multiplayer rules. We are given two versions of this, Coalition of Death and Triumph and Treachery. Coalition of Death is for when you want to make teams. If you have four players then you would do two teams of two, or if you have five players then you would do one team of two and one team of three. That may seem unbalanced, but they have provided you with battleplans to help make it work. Coalition of Death has two battleplans, one of which is meant to reenact a heroic last stand, where one of the sides is meant to be vastly outnumbered. Both of them seem like a lot of fun. My very first game of AoS was actually a team game of two versus two, and I had a blast. The second mode of play, Triumph and Treachery, is for when each player is on their own. Many people may recognize this as a new version of a hugely popular expansion to Warhammer Fantasy 8th edition, and this one looks to be just as fun. The rules mostly just give you guidelines on how to do things like turn order and combat order. One really interesting mechanic is the combat order. The player whose turn it is gets to pick which combat they want to fight first of course, but after that they get to choose the order of players after them. This could lead to plenty of tactical situations or even underhanded alliances as players make agreements on what order to pick stuff in. They give you a few different battleplans for this, all of which have very unique deployments, special rules, victory conditions, and in some cases, battlefield shapes. While the Open Play part is definitely the shortest of the three sections, the multiplayer rules it introduces are a great and welcome addition to the game. The second section of the General's Handbook deals with narrative play, something anyone who has been following the campaign books may be familiar with. The first part of it goes over what makes up a themed army, which is just basing your army around a particular idea or storyline. This is something a lot of people already do, but it's nice that it covers the idea for people who may not be familiar with it. There are also a handful of battleplans in here taken from the various campaign books. If you have been following along with the books already then none of these will be new to you, but again, it's a nice inclusion for people who don't own the campaign books. It also gives some fun scenarios to play for people who may be picking this book up as their first book for AoS. That was one of the complaints I heard about the original rules release, that this game works best with scenarios instead of the generic one in the four page rules. Now everyone has access to a few to get them started and experience how AoS plays best. Next we move on to a few example storylines and their battleplans. The first expands upon a brief two line story hook from the start of AoS involving the Celestant-Prime. They delve deeper into their story as the Prime comes to the assistance of a couple of Stormhosts who were failing at securing a vital bridge from the Bloodbound in Aqshy at the start of the Age of Sigmar. It's great seeing them taking a small hook like this and developing it more. It's what I always hoped they would do with all of the small one to two line bits of story and what I'm sure they hoped we would do as well. If nothing else this shows players out there what they can do one their own, perhaps with all of those great timelines from all of the books. This is followed by a battleplan to recreate the event, but not only does it provide you with the scenario, it provides you with the exact composition of each army if you really want to play through it exactly as it happened. The second one of these follows the death of Nagash at the hands of Archaon. The story has the forces of Chaos invading Shyish and pursuing Nagash through the underworlds until they have him cornered. It's a great story, although I may be a little biased with my affinity for the Death alliance. This is also followed by a battleplan, but this one is meant to be played by several players on two different teams. The army composition is broken down by player, for example, one player must control Nagash's personal section of the army, which consists of Nagash, four Morghasts, twelve spirit hosts, twenty hexwraiths, five cairn wraiths, and two Mortis Engines. That's just one fourth of the Death side of the battle, so you can tell this is meant to be a huge affair. In fact, that table they have you play on is even larger than a normal table. This looks like it would be a ton of fun to play. The largest section for Narrative Play is the Path to Glory Campaign ruleset. This was previously just released for Chaos as an online supplement, but here they have expanded it to even more factions. The premise of these rules is that you pick your champion and then generate your warband around them. Then with each battle you gain experience and more followers. It's a fun ruleset for playing smaller, themed games that allows you to slowly build up your army as you go. There are tables that you roll on to generate your warband as well as other tables for the rewards that you gain. It also gives you the option of just picking what you want if you don't want to randomly generate it. Beyond just the Chaos faction, where you can also pick which god you are aligned with, they have included rules for using Stormcast, Fyreslayers, Skaven, Ironjawz, Sylvaneth, and Death. There are two scenarios for you to use with the Path to Glory ruleset, but I'm sure that it wouldn't be that hard to slightly tweak other existing battleplans to work with it as well. The last three sections in the Narrative Play part deals with the different types of campaigns you can run. The first one is Map Campaigns. It briefly goes over what a map campaign is then provides you with one page of rules for an example map campaign they put together. Something I think is really cool here is that they made the map for the campaign by using one tile of a Realm of Battle table and a bunch of creative modeling. This could easily be used with the Mighty Empires tile set too if you have that. Next we have tree campaigns, which is where you play a battle, if player A wins then you play one scenario next, if player B wins then you play a different scenario. This way you can play out a storyline that realistically portrays one side having dominance over the other. Once again they provide you with one page of rules for an example tree campaign called Clash of Wills, but they also provide you with the battleplans for each scenario. These are all pretty straight forward scenarios using the basic victory conditions from the core rules, but each has a few special rules in it as well. It's pretty cool and gives you a good idea of how to make your own or you can even just play through the campaign they have provided. The last type of campaign is a matrix. Each round each player picks what they will do, as in scout, attack, defend, etc. Then you consult a table and cross reference the two players' choices and see what scenario you will play. The example rules they provide for this has you fighting the same story as the tree campaign, the Battle of Verdigris Plains. Now this is the part that a lot of people are most interested in. They briefly go over what Matched Play is, which is basically just a more structured way of playing AoS. Ladder Campaigns are introduced, which is basically just a structured way of determining who is the best player within a group of players. All of the players are ranked and can challenge each other. You move up or down the ladder depending on how you do in your battles. After a set amount of time the campaign is over and a winner is announced. They also talk about tournament play and the different types of tournaments you can find. This includes talking about how most tournaments will have rules packets that may slightly tweak the rules of AoS and Matched Play to suit their needs. There is a small section talking about House Rules, which are essentially any rules you change. It mentions playing base to base as a very common one, which is rather cool. Even though they don't officially endorse this as the way to play Matched Play it's nice that they acknowledge that a lot of people out there play this way. Pitched Battles is that part of this everyone has been talking about. Here you will find rules for playing much more structured and standardized games of AoS. There are three types of games, Vanguard, which are up to 1,000 points, Battlehost, which is 2,000 points and the standard size they recommend, and Warhost, which is 2,500 points or more. It also lists roughly how long each of these battles should take and the size of table you should play on. For example, a Vanguard game should be played on a 4' x 4' table and can take roughly an hour and a half to play. There are also the three rules of one. These include the restrictions that each spell can only be cast once per turn, rolls of one to hit, wound, or save always fail, and the attacks the generate additional attacks cannot further generate more additional attacks. They are all pretty sensible restrictions on the game, some of which were already being utilized by a lot of people. There are a few other restriuctions, such as how summoning works, as well as how monsters in cover works. Summoning now must be factored into your army. For example, if you are playing a 2,000 point game and you want to summon 300 points of models, those 300 points comes out of your 2,000 points, so you will only deploy 1,700 points of your army. Armies now have a bit more structure as well with unit designations of either Leader, Artillery, Behemoth, Battleline, and no designation. Each level of game has different restrictions on these designations. In a 2,000 point game you can take one to six heroes and must take at least three Battleline units for example. Battleline is the biggest change since it forces you to take more standard units instead of just loading up on highly specialized units. I like this change since it makes people take armies that look a bit more like regular armies instead of just a bunch of monsters or something. Units without a designation have no restrictions on them. There is also the recommendation of playing Pitched Battles with just points, but no unit designations if you want. After this we get a listing of points for each faction, including all of the compendiums such as Tomb Kings and Brettonians. Anything that was in a Battletome, Compendium, or Grand Alliance book gets points. This includes Battalions. Battalions from boxsets or campaign books are not included here though since they are meant more for Open or Narrative play. It also shows you the unit designation for everything. Some units will have a Battleline designation only if your entire army has the Ironjawz keyword for example. This allows you to build a highly specialized and themed force and rewards players for sticking to one theme. They have included six pitched battle battleplans that offer an equal chance to both sides but in some really fun and creative ways. These include Take and Hold, Blood and Glory, Escalation, Border War, Three Places of Power, and Gifts From the Heavens. All of them are objective based instead of just killing your opponents stuff. So far I have played Blood and Glory and it was a ton of fun. The game swung back and forth the whole time with my opponent managing to sneak out a victory on the last turn. I am really excited to try out the rest of these. Gifts from the Heavens seems really interesting to me and is what I will probably try next. Any one of these would make for a very fun and engaging game and are great for tournaments and pick up games alike. Something that is pretty cool is that they give us a full battle report between a Stormcast army and a Chaos army. This makes full use of all of the Pitched Battle rules and is everything you would expect from the battle reports we were all familiar with. I really enjoyed this part and it's also a great example of their new rules in play. Lastly we are also introduced to Allegiance Abilities. Here we get abilities for the four grand alliances, Order, Chaos, Death, and Destruction. Going forward though each battletome will have its own set of Allegiance Abilities. We have already seen this with the Sylvaneth, Bonesplitterz, and Beastclaw Raiders, and I assume we will see some for older battletomes at some point as well. If you have a pure Bonesplitterz force for example then before the battle begins you must choose if you are going to use the Destruction or Bonesplitterz Allegiance Abilities since your army qualifies for both. The Allegiance Abilities for the four grand alliances in the General's Handbook each have one army special rule, six command traits, and six artifacts. Your general gets a unique command trait which you can either roll for randomly or choose the one that best suits your model. Named characters like Nagash or Archaon don't get this though since they are already special enough. The artifacts are basically wargear items for any hero in your army. You get to roll or pick one for one hero in your army, and then an additional one for each battalion. I really love the unique flavor this can add to your force and heroes. The four pages of core rules are of course included in here at the very end. I think calling this a must buy for Age of Sigmar fans is a more than fair statement. The amount of extra added value this brings to the game is outstanding. I also really like that they put the three different modes of play in for the game, making sure everyone's preferred method is legitimized. I have a feeling that a lot of people who had rage quit the game will be coming back with the inclusion of points now. The Allegiance Abilities are definitely one of my favorite additions to the game from the General's Handbook. With it only costing $25 too I don't see why you would pass it up. I think this, bundled with their new Getting Started magazine and their new smaller starter set would be the perfect buy in for a new player, and it would be fairly cheap too. Or even the General's Handbook alongside one of the new Getting Started! boxes if Stormcast or Bloodbound are not your thing. This is definitely a massive home run by Games Workshop with every part of the book handled with perfection. If you play AoS or are curious about getting into the game then you can't go wrong with the General's Handbook. Season of War Painting Competition Winners!